Showing results for tags 'sri lanka'. Does anyone know a bank that provides personal loans (for a vehicle) of around 4.5 million for a salary about 200,000 earned by foreign employment. Was thinking of importing a BMW m50 engine or even a jz motor. Any one have any information how the tax system works for importing just the engine of a car? Does anybody in SL that you know of do BMW coding? 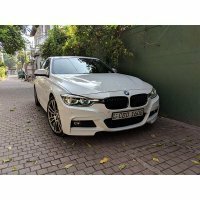 Hi guys, Do you happen to know anybody in Sri Lanka that does BMW coding. I need to do a LCI headlight conversion on my pre LCI BMW E60. Saw this video on FB and thought of sharing it with you guys. I think better to fix video camera's on all directions in your vehicle when you drive Feel free to share any other traffic violations or related videos/photos in this thread. Sri Lanka; Land of Paradise, Land of honking!!! The first question when a tourist visit to Sri Lanka is, "why you guys are honking this much?". A question that I even don't know the answer. We Sri Lankans uses our car horn for every reason. If we see a friend; we honk, if we see an enemy; we honk, if we see a girl; we honk, if we want to overtake; we honk, we are rather than driving the car; we honk the horn. In my personal experience, near Orugodawatte Junction in the morning time we can hear more than 25 honks per minute. Following are some honking etiquettes that I presume too good to share. When is it appropriate to use your horn? Generally, you should only honk the horn when reasonably necessary to insure safe driving. For example, if your brakes have gone out, honk to alert other drivers. Use your horn to promote safe driving However, there are times when it is common and acceptable to use your horn when there’s no immediate threat of a crash. Keep in mind that there is a big difference between giving a quick “beep” and laying on your horn with an obnoxious “BEEEEEEEEEEP”. For example, if the driver in front of you at a red light is not paying attention when the light changes to green, wait at least 4 seconds and then give a light, quick tap on the horn. If another driver is driving too close to the lane line or almost hits you, it is appropriate to give a quick “beep” to let them know that they made a driving error and need to be more cautious. A quick honk of the horn can mean “Watch what you’re doing!” Don’t use your horn to vent frustration Your horn is not a way for you to tell another driver you don’t like their driving. If someone’s driving creates an ongoing danger, call the police. Never lay on your horn out of frustration with another driver. Many instances of road rage begin with aggressive horn honking. You never know another driver’s state of mind, the kind of day they’re having, or how they’ll react to your blaring horn. Your safety is the top priority, so be calm when driving. If you must honk your horn at someone, do it lightly. Also, do not yell, mouth words, or use hand gestures to show your anger. Don’t use your horn to ask “What’s Happening?” Do not honk at your friends because this could alarm other drivers. You may startle another driver into slamming on their brakes, aborting their turn, or performing some other dangerous maneuver. Your horn is not a way to say “Hey” as you drive past your friends. No, your horn cannot magically clear a traffic jam If you’re stuck in a traffic jam, don’t honk. It isn’t going to make the situation any better; in fact, it will make it worse for everyone around you. Unless you are in a parade or stuck in a parking garage after your favorite baseball team just won the World Series, you should never lay on your horn in traffic. Honking is sometimes against the law In some cities, honking your horn between certain hours is against the law. I don’t think anyone will miss the neighborhood carpool mom honking at 6:00 a.m. to get the kids outside. You don’t have to worry about breaking the law if you use your horn only when absolutely necessary. Not wanting to get out of the car and ring the doorbell is not grounds for using your horn. Honk if you’re … Honking does not always pertain to alerting other drivers. Honking has become a way of showing support. For example, some people honk when they drive past students having car wash fund raisers. In Detroit, a U.S. District Judge ruled that not allowing “honking for peace” in anti-war demonstrations would be against the First Amendment. The bottom line is to refrain from immediately reacting to a driver’s “wrong” move by laying on your horn or even giving a quick beep. People make mistakes and sometimes you need to just let it go rather than using your horn to vent. The simple rule: only use your horn when necessary. When practicing with your teen, watch how he or she reacts when other drivers make mistakes. Discuss why honking would or would not have been appropriate for each situation. Thank you! Danushka. Hi Guys, I was looking for a Honda FIT Hybrid GP5 and after visiting many places in couple of weeks time, I met few people who helped me to understand the reality of Car Sales and Imports. I almost shocked by hearing and what SL importers ( Not ALL ) do. It was about cut a car in half, bring it down here as separate parts and weld them ( Assume there has to be a more technical term than "Weld" ) together and sell them through Car Sales around the country. (Again not in all car sales) However, I was not able to buy a GP5 and price went up (Recently) and was asked to wait few more months at least till December by a friend of mine who bring down cars. I just shared these to let know the people who still don't know (like myself a couple of months back). Also finally, I would like posting / advising me a better way of getting a GP5 ( I mean without being trapped to such places) Thanks. Today I have feel a vibration on my 2005 Mazda 3 + engine light start to glow , had to stop in a service station. They have found that one of my mazda 3 ignition coil need to be replaced. So i have tried with Asiri Motors and replace the ignition coil (NOT GENUINE) -> 6,000. After the replacement the engine light gone for quite few minutes and start to light again. With the ECU monitoring system, it's detected and ask to replace with the genuine coil. For now engine works perfectly. Problem is Either Asiri Motors or Colonial motors doesn't have the Genuine Ignition Coils. They said that it will need at least 3 weeks to order and price will be 19,000 to 25,000 (One Coil). I feel like that is too much for a ignition coil. Is there any other places that i can try.!! or what should i do?? Mazda experts please help me on this. Because i really enjoyed the driving pleasure of the Mazda, But now i am kinda worried. Hi friends, Kindly post if you have experience of getting down a walkie talkie set (2 radios without a repeater) from ebay or somewhere. May be a kids one that can communicate within a range of 100m - 1km or so. I do not have any idea whether we have to take special permission for that as it is kind of a kids toy such as these. I couldn't find a place here is Colombo that I can buy and may be if it is not causing any legal matters, thinking of ordering via ebay. Thanks a lot in advance. 1.NAME OF EVENT :CMSC DRAG 2012 2.VENUE OF EVENT :Katukurunda Air Force Base – Kalutara 3.RACE DISTANCE :Approximately 400m 4.STATUS :Club Meet with National and Regional Participation 5.DATE OF EVENT :9th December, 2012 6.AUTHORITY :This event is held under the Supplementary Regulations (S.R) and any Additional Supplementary Regulations (A.S.R) issued by the Organizers, under sanction by Ceylon Motor Sports Club (CMSC) & Sri Lanka Automobile Sport 7.EVENT PROMOTER :Ceylon Motor Sports Club. 9.ORGANISERS :Ceylon Motor Sports Club. RACE CLASSES 11. CLASSES AND ENGINES 11.1. CLASSES Class 1: Cars upto 1300cc – N/A Class 2: Cars 1301cc upto 1500cc – N/A Class 3: Cars 1501cc upto 1600cc – N/A Class 4: Cars 1601cc upto 2200cc – N/A Class 5: Cars Open 2WD Class 6: Cars upto 3500cc AWD Stock Turbo Charged Class 7: Cars Open 4WD Class 8: Bikes upto 600cc Class 9: Bikes over 601cc Class 10:Cars upto 1600cc turbo open •N/A - Normally Aspirated. 11.2.ENGINES 11.2.1. Rotary Engine: Engine capacity will be multiplied by a factor of 2.0 13. ENTRIES 13.1.Entry Dates: Opening Dates : 19th November, 2012 Closing Date : 6th December, 2012 13.2. Entry Fee: Rs 5000.00 per entry. This amount goes directly to the Air Force Seva Vanitha Unit to assist the differently abled children of the Air Force personnel. Completed entry form must be submitted with full entry fee to specified collection centre. 13.6.Entry Submission and Payment 13.6.1. STEP 1: Entries are to be registered at “No. 2/1, Hunupitiya Rd,Colombo 2, from 9am to 4pm. Citroen Ds3 Sports In Sl. some info for the car fans, A white colour citroen ds3 is up for sale at BRJW for 12million rupees.this is the first car of this edition in SL.Also there are only 2000 units produced of this model and only 200 in uk. what a good thing to have one here!!!!!!!!! http://www.citroen.c...ds3/ds3-racing/ it looks exactly like the one in the pic..